Life is not a fairy tale,if you lose a shoe at midnight , you're drunk. after asking the question I was advised last night, to attend this Trad shoot you will require an Alliance Card. Excuse my ignorance- what’s an Alliance card? This is an Archery Alliance Cross-Participation Shoot open to ABA, 3DAAA, TAA and AA Members - BRING YOUR MEMBERSHIP CARD - We must sight a current membership - No Card No Shoot, No Exceptions - This is an insurance requirement for our club and this shoot. 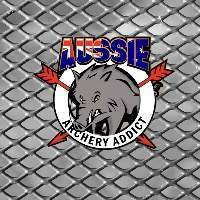 Set among the boulders on a spectacular Granite Belt ridge just outside Stanthorpe in South Queensland, the shoot is all about 'single-string' archery fun. Catering for all ages shooting traditional bows of all kinds, showcasing archers skills with wooden arrows this shoot doesn't leave any single string brothers/sisters out as we also offer a "Modern Traditional" division for archers preferring to shoot carbon arrows from their single string bows. Fully catered throughout the weekend with ample bush camping, hot showers and toilets provided. Come and tackle the Granite Mountain at our second annual Traditional Shoot with an emphasis on FUN AND FRIENDSHIP. PLEASE NOTE: NO DOGS POLICY FOR THIS SHOOT, THANKS. I'm planning to be there again this year as it was a great shoot last year. Will not be at this one. hey guys, I see its not on the flyer but companion dogs/cats/gold fish will be allowed at our shoot providing they're kept under control at campsites. only 6 sleeps to go - and if your heading down to the shoot, may I suggest you pack a jumper. yes 9deg. and 8 deg. forecast for the mornings, plenty of firewood been put at the camping grounds . I should set up a go fund me page to get my shoulder fixed, so that I can shoot again. Not so funny though, its been almost a year since I attended a shoot. challenging situations.......which tried our skills in enjoyable ways. lacking without the Granite Belt Twist. Looking forward to the next shoot already. Appreciate the friendly atmosphere. Lets do it again. Attended last year and this year - this Shoot only gets better. Thank you Granite Belt for a fantastic shoot. See you next year. Good onya Dismal, you are a champion mate, look after that foot hey. *Attending the Stanthorpe Trad shoot over the weekend of April 28/29 there were about 30 archers from around south east Qld with some travelling from as far away as Newcastle in NSW. They had 3 x 20 target ranges to be shot - 1 X 3D animal range, 1 X Nostalgia range of the older black and white ABA paper targets, 1 X IFA vinyl animal range with all scoring of 10 for a kill and 5 for a wound. 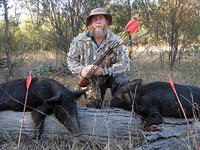 The novelties were - running pig, 30 second speed round, 60 second Hunter round of 5 X 3D deer targets with 10 to 12 paces between each shooting peg. The Hunt round was set up on an incline which had some archers huffing and puffing by the time they were done. On Saturday evening after dinner we had live music which was really excellent, as well as a V Shoot held on the practice range which generated some great shooting and lots of laughs. Target placements were out to about 30 metres and hunting style shots with some targets partly obscured by trees or shrubbery. A little "moving around the peg" was the order of the day! The GBB Team catered all meals from Friday night through to Sunday lunch and the food was plentiful, hearty and great value. The Granite Belt Bowmen is a small but very friendly club that really know how to put on a great shoot. - a great joint effort. Thank You.